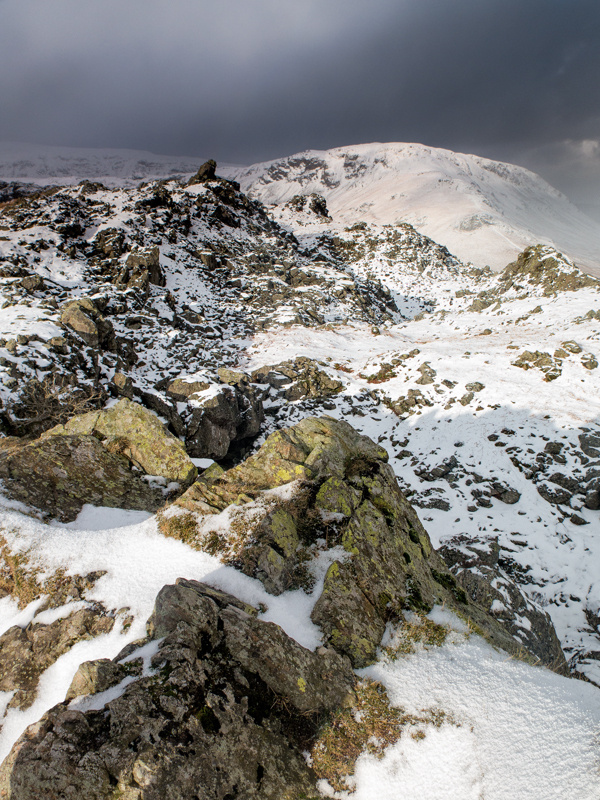 In Friday’s blog post I mentioned that I was heading up to the Lake District for some photography. To be honest, I wasn’t particularly hopeful as the plan was to climb some of the hills there and see what took our fancy. The weather forecast in the area was for snow/rain showers at sea level so I expected snow showers on the hills – I wasn’t disappointed. In the end the weather forecast was pretty much spot on although the snow shower on the decent felt as though it has set in for the day and was quite heavy. Despite this we managed some reasonable photography and I managed to get a feel for the new Canon G16 compact camera that I had in my pocket. Image quality is really quite good. Noise is well controlled even when shooting at ISO800. It appears on the face of it to be better than the LX7 in this respect. Image sharpness is good although it tends to go a little soft in the corners and is not as sharp as the LX7. I suspect the image circle of the G16 is smaller than the LX7 which means the lens corners are softer. They are though perfectly acceptable and the centre of the image is very good. I found the 28mm end of the lens frustrating and really wanted to go to 24mm. At the other end of the zoom range the extra reach in comparison to the LX7 was most welcome and I found myself using it quite a lot to isolate areas of the distant hills. I can’t say that Preferred one over the other but would like someone to make a 24-140mm lens (my RX10 is perfect but large). The filter adapter that fits around the lens takes the same approach as the LX5 (a lens tube surrounding the lens) where the LX7 attaches to the front of the lens. This makes the G16 quite bulky when the adapter is attached but it is quick and easy to remove using a bayonet style attachment rather than a regular screw thread. All things considered I prefer the LX7 method for the reason in the next bullet. I had been looking forward to using the optical viewfinder on the G16 rather than an EVF but in the field I found 2 big drawbacks. First the viewfinder is quite small which made it difficult to use. Secondly, the lens adapter tube got in the way because the viewfinder was centred over the lens. In fact the adapter tube made the optical viewfinder almost completely useless because you can’t see the image. When will manufacturers learn to field test equipment with real photographers? The colours rendered by the G16 are very nice but they are also a little on the warm side. I found the button combinations on the G16 a little tricky, less intuitive and more frustrating than the LX7. This could in part be my lack of familiarity with the G16 although I wasn’t making mistakes, just having to go through menus and multiple button presses to get it to do what I wanted. I may be able to fix this when I read the manual on how to programme the buttons. It may sound daft but I found that I liked working with the Canon RAW files in post production. Some RAW files just feel more flexible and forgiving than others. When I was out in the field I found there was very little latitude to expose to the right. In fact I struggled to avoid the flashing highlights in almost all my shots. Blown highlights were everywhere despite using a 2 stop ND grad. In the end I just gave up trying to control this and turned it off. Back on the computer when I have loaded in the RAW file it looks like there is plenty of headroom in the highlights which is a little frustrating. Overall the G16 is a nice camera to use and will produce good results, but I can’t see it replacing my LX7. Will I keep both? Yes for the time being. I want to use the G16 in an urban environment as it seems to be more suited to this than Landscapes. The other thing I am going to do is make more use of my GM1. I bought this as a high quality compact camera and whilst the image quality is superb (on a par with the EM5) the 24-64mm equivalent lens is a little restrictive. I therefore intend to buy the 70mm-200mm (small GM ultra compact) lens. I can easily carry the camera in one pocket and the lens in the other. This strangely may make a better option for a carry anywhere camera. I’ll be eagerly watching for your GM1 results. I am very pleased with my GM5, and it’s viewfinder is quite adequate for me. The Olympus 9-18 is a great companion for going wider than the 12-32. I will add the 35-100 to my kit eventually, and it all fits comfortably in jacket pockets with the camera carried in a belt bag. I find the image quality to be quite satisfactory. I shot a bit with the GM1 mid last year but then haven’t really retrned to using it. The quality was excellent and it’s a great city camera, i just found the 12-32 lens too limiting in range. I think when I have the 35-100 I will make more use of it. I thought the image quality was superb and I particularly like the colour handling. I also wish it had a viewfinder but you can’t have everything I supose. Interesting, I have just got one to replace an LX3 that I loved, the only thing I had to get used to was the shutter button, I found it rather over sensitive and fired off very easily. I didn’t find a problem with the shutter button. My frustrations were around things such as not beig able to switch format easily. I also kept putting it into macro mode where the LX has a switch on the side of the lens for both of these. I also found the focus button a little tricky to get used to. I had the LX programed to use the Function button for focus and this is also one of the directional buttons to position the focus point. This made it very easy to use and I did find I missed it. But I do like the results. I have been making some A3 prints and they look great. I have got used to the shutter button but it took me by surprise to start with, good results are the important bit. couldn’t agree more. In nother post about the quality. The more I think about this camera the more I like it.